U .S. GAM E SSY STE M S, IN C .
Dear Friends: Join us in celebrating the 50th anniversary of the founding of U.S. Games Systems and the 140th anniversary of the birth of Pamela Colman Smith. U.S. Games Systems’ first product in 1968 was the Swiss1JJ Tarot deck. Brentano’s bookstore in New York City placed an opening order for 100 decks and the buyer commented, “I don’t know how well tarot will sell, but let’s try it.” Within a few years, sales of the 1JJ Tarot deck and accompanying book, Tarot Cards for Fun and Fortune Telling, each exceeded 800,000 copies. Thus, U.S. Games Systems entered the world of tarot at a time when tarot was scarcely known and considered foremost part of the occult. Today, tarot is a mainstream product that inspires millions of people. U.S. Games Systems publishes high quality tarot decks that are distributed throughout the world. We are the publishers of the Rider-Waite Tarot and its many popular variations. In addition to tarot, this catalog features oracle, inspirational and Lenormand decks, plus books. Pamela Colman Smith, the artist of the Rider-Waite Tarot deck, is little-known outside the tarot field. Pamela was an artist, writer, poet, author, folklorist, editor, suffragette, publisher, and costume and stage designer who was active from the mid-1880s through the 1920s. Four scholars have come together to create Pamela Colman Smith: The Untold Story, a 440-page hardcover book in full color detailing her life and reproducing over 400 illustrations of her non-tarot art. Games, Gifts & Novelties.............. 72-73 Index................................................. 74-75 All prices in the catalog are retail. Where retail price is followed by a star, the wholesale price differs from our standard discount. All prices and country of manufacture are subject to change. All Premier Editions come packaged in oversized case and include spread sheet. I wish to thank the wonderfully talented artists and authors who have allowed U.S. Games Systems to publish their work over the years. Their creativity and passion are the backbone of our publishing business. Most of all, I want to thank you, the customer. Without your loyalty and support U.S. Games Systems would never have been successful. Our company will continue to strive to publish the best products, and we thank you for being part of the U.S. Games Systems family. Order online for 24/7 convenience and web-only deals! Scan here to visit us on Facebook! 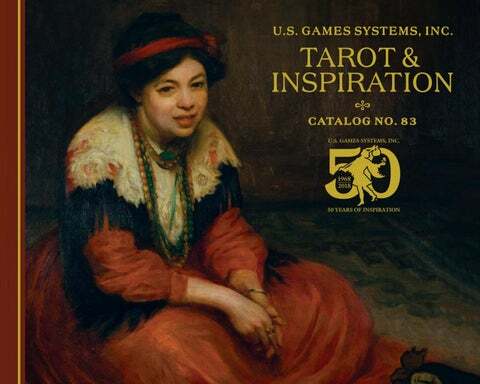 Stuart R. Kaplan U.S. GAMES SYSTEMS, INC.
Pamela Colman Smith: The Untold Story brings together the work of four distinguished scholars who have devoted years of research to uncover the life and artistic accomplishments of Pamela Colman Smith. Known to millions as the creator of the Rider-Waite® Tarot deck, Pamela Colman Smith (1878–1951) was also a stage and costume designer, folklorist, poet, author, illustrator of ballads and folktales, suffragette, and publisher of books and broadsheets. This collaborative work presents: a richly illustrated biography of Pamela’s life with essays on the events and people that influenced her including Jack Yeats, Ellen Terry, Alfred Stieglitz, Bram Stoker and William Gillette. There is also a chronological survey of her folktales, art and poetry and an exploration of her lasting legacy. 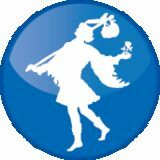 Over 400 color images of Pamela’s non-tarot art have been curated from her publications including A Broad Sheet, The Green Sheaf, Blue Beard, Annancy stories, Russian ballet, costumes, stage designs, Irish magazines, book illustrations, posters and much more. In creating Ethereal Visions Tarot, Matt Hughes has drawn inspiration from the Art Nouveau movement, adopting its distinctive style and meticulous approach to craftsmanship. The artist has also created two additional cards to supplement the traditional Major Arcana. Every detailed image in the 80-card deck is hand drawn and colored. Box and cards are illuminated with elegant gold foil stamping. Includes 48-page booklet. Angels’ spiritual influence over human experience is beautifully portrayed in this gilt-edge deck through classicinspired artwork. The 184-page illustrated guidebook features in-depth descriptions, symbolism and angelic messages. In addition to the 78 tarot cards, two reference cards are included in this glorious set presented in a deluxe box with gold foil accents. This color-coded deck takes kids through three imaginary adventures at the beach, in the zoo, and through India. Along the way, kids learn how to do 42 fun yoga poses. As they twist, stretch, crawl and bend, kids improve their flexibility, balance and focus. Each card presents a lively scene with easy instructions for the yoga pose on the back of the card. Uniquely relevant and accessible, New Era Elements replaces the esoteric symbolism of traditional tarot with intriguing images of 21st century global life. Pieper’s four tarot suits are explicitly connected to the four elements (Fire, Water, Air and Earth), and the court cards represent four distinct world cultures. Includes 80 cards and 116page guidebook. Miniature versions of the 78 Radiant Rider-Waite® cards are paired with simple, down-to-earth tarot guidance. Expert advice is printed right on the cards, so there’s no need to look up tarot meanings in a booklet. This handy, pocket-sized deck is perfect for beginners, advanced readers and everyone in between. Also by Jody Bergsma: Magical Times Empowerment Cards and Spirit of the Wheel Meditation Deck (pages 42 and 57). Let your inner artist out. Find ways to channel your creative passions. Keep a notebook handy to capture your ideas and thoughts. Crayon s and a blank sheet of 19 . THE SUN paper can let you expres s yourself Generous doses of happiness are as canvas and as much oil. focused on you. Keep your attitude light. Family events will bring youexplore what excites Simply and unexpected joy. inspires you. Any health concerns will be less than you fear. Throw your arms out to declare satisfaction with the world at large. All heads turn to you as it’s time for you to be noticed. Drawing on the ancient discipline of interpreting the night sky, Black Moon Astrology Cards give you access to the wisdom in the heavens above. Astrology reveals the insight and knowledge that is written in the stars. Based upon the important placements of a horoscope, this 52-card deck offers an in-depth tool for divination and self-awareness. The 184page guidebook makes the principles and revelations of astrology accessible to all. This deck returns to you the holy power of Celtic blessings, providing a pathway to reconnection with the Divine. Lucy Cavendish’s compassionate messages bring hope, inspiration, understanding and encouragement for all of life’s gateways. Jane Starr Weils’ exquisite illustrations provide a visual feast that will restore your spirit. Dreams are love letters from home written in our first language—the language of the soul. Always pointing us toward higher ground, the soul speaks to us through our dreams in pictures and metaphors. Dream Oracle Cards explore 53 of the most common modern dream symbols and archetypes. The accompanying 136-page illustrated guidebook contains a message, a meaning and a mantra for each card. Earth Warriors Oracle taps into universal tribal wisdom to empower your soul with the courage and optimism to discover the warrior within. Earth Warriors are the guardians and guides for the new world, inspiring people to thrive in harmony with the wisdom of life. Earth Warriors urge the human race forward with positive energy, purpose and passion. Set includes 44 cards and 216-page illustrated guidebook. This luscious 44-card oracle deck was created to help you discover your own inner divine priestess of love, medicine woman, gypsy spirit, mermaid soul, empowered warrior goddess and more. The guidebook by Alana Fairchild will help you awaken your courage and your soul talents as you learn to express your passionate purpose. The set includes 44 cards and 96-page guidebook. Enter an extraordinary world of color, magic and hope with Messages of Life cards. The light-filled images and inspirational text work together to turn on the divine within you. Meditate on the messages or repeat them as powerful, affirming mantras. Allow the enlightening artwork to lift your consciousness to insight, truth and harmony. Includes 54 oversized cards. $23.95 ITEM # MOF54 54 cards, 3.125” x 6.75” Box, 3.65” x 7.25” Made in China Also by Mario Duguay: Lightworker Oracle and Oracle of the Angels (pages 41 and 49). Positive Astrology Cards are designed for both beginners and experienced astrologers to unlock the ancient wisdom of the stars. The detailed guidebook assists you in understanding your natal chart and your personality. Illustrated instructions teach you how to best utilize the qualities of the zodiac’s daily and monthly cycles for abundance and success. The set consists of 73 cards and 76-page illustrated guidebook. Connecting with animals allows us to use their spiritual powers and adopt their wisdom as our own. This deck helps you find your very own personal animal guide that will help you with current and future situations throughout your whole life. Use the power and the messages they provide in this deck to develop and strengthen your own potential. Set includes 49 cards and 60-page guidebook. The Whispers of Healing Oracle is here to nourish, strengthen and restore you to emotional, physical and spiritual wellbeing. The soothing energy and wisdom of this deck will help you navigate your way to balance, wholeness and wellness. Set includes 50 cards and 88-page guidebook. $23.95 ITEM # WHO50 50 cards, 3.75” x 5.5” Box, 5” x 6.75” Made in China Also by Josephine Wall: Mystical Wisdom Cards, Nature’s Whispers Oracle, and Whispers of Love Oracle (pages 47, 48 and 65). Golden Dawn led to a commission from Arthur Edward Waite to create a 78-card tarot deck. Originally known as the Rider deck, it was the first to include full pictorial scenes for the Minor Arcana pips. Pamela’s varied mystical influences are evident throughout the deck. Once considered revolutionary, The Rider-Waite® deck has set the standard for hundreds of other decks and has inspired a myriad of different versions available here. Pamela Colman Smith‘s artwork was pumped up with vibrant colors by Frankie Albano in 1968 and this deck has remained a staple for tarot collectors since. The bright colors help readers focus on details they might have otherwise missed. This vivid deck appeals to those nostalgic for the psychedelic sixties or who appreciate the "wow” factor. Includes 24-page booklet. This deck/book set provides everything you need to understand tarot. The full-size deck is a boldly re-colored version of the classic Rider-Waite deck, updated with vibrant shading that gives depth to the familiar tarot scenes. The 272-page, userfriendly handbook with color illustrations is perfect for beginners as well as experienced readers. Universal Waite Tarot is now available as the world’s smallest complete tarot deck! $8.95 ITEM # TUW78	78 cards, 1.1875” x 1.375”	Made in China Also available: Tiny Tarot Key Chain (page 73). Borderless Edition Pamela Colman Smith’s beloved tarot artwork, created in 1909, is presented in a borderless format for a more immersive reading experience. This 84-card deck includes four extra cards with reproduction samples of Pixie’s non-tarot artwork, including "Catch Me” and "Duet”. With instruction booklet. The magnificent Crowley Thoth Tarot deck contains the kabbalistic and astrological attributions described in Aleister Crowley’s The Book of Thoth. Includes booklet. Contains 78-card Crowley Thoth Small Tarot deck and Tarot: Mirror of the Soul book by Gerd Ziegler. Packaged in plastic bookcase box. Spread sheet not included. Swiss Crowley deck includes 78 cards originally painted by Lady Frieda Harris, under the direction of Aleister Crowley. Includes 48-page booklet. The Angel Inspiration Deck was created to bring you closer to the Angels so that you may receive their assistance. Each uplifting message includes meanings, advice and affirmations to help strengthen your connection to the energy of each Angel. Includes 44 cards, 60-page guidebook and an Angel Reference Chart. Simple inspirations are delivered by a host of angels. The 64 illustrated cards each offer an affirmation and a maxim for daily meditation. $21.95 ITEM # AI44 44 cards, 3.5” x 5” Made in China Also by Kim Dreyer: Conscious Spirit Oracle (page 26). This charming boxed set of 40 affirmation cards were inspired and channeled from Debbie's Angels. Pick a message each morning before you start your day to see what guidance or encouragement your angels wish to share with you. Remember, your angels love to guide and help you. The angels deliver the positive messages on these 40 pocket-sized cards to bring you strength and encouragement throughout your day. To use them, sit quietly, close your eyes and ask the angels what message they wish to share with you. The card you choose is the one the angels intend for you! The compelling imagery in this best-selling deck brings medieval tarot symbolism into the modern Aquarian age. Includes booklet. The Archeon Tarot reveals layers of meaning in the cards’ mystical symbolism and dream imagery. This deck offers unique perspectives and a contemporary appeal. Includes booklet. Also by David Palladini: The New Palladini Tarot (page 49). This luminescent oracle deck provides a powerful vehicle for accessing the wisdom of mythic beings and divine entities. 52 oversized, gilded cards feature stunning artwork. Set includes 108-page illustrated guidebook. This stunning 52-card oracle deck helps you reconnect with your origins in the stars, the source of all creativity. Insightful cosmic connections enable you to discover positive solutions and heighten your intuitive skills. Includes 114-page illustrated guidebook. This deck can be used with Art Through the Eyes of the Soul Oracle. Learn to communicate with angels with these illuminating oracle cards. Includes 42 cards in pouch, and 116-page illustrated guidebook. Royal advice dispensed with scintillating wit and historical wisdom. To consult their majesties, simply choose a card and your special message will be revealed. Forty oversized cards are packaged in a deluxe, hinged box. $15.95 ITEM # ATQ42 40 cards, 5.75” x 4.25” Made in China Also by Kris Waldherr: Goddess Tarot, Lover's Path Tarot, and Sacred World Oracle (pages 35, 42, and 55). Juliet Sharman-Burke’s teaching method introduces the Minor cards first, with layouts for each suit. Her thematic approach uses colors and visual symbols to explore archetypes and elements in tarot. Includes 78 cards and 192-page illustrated book. The Blue Bird Lenormand deck has an updated design with elegant, classic artwork. The 38-card deck now has extra Gentleman and Lady cards. It features playing card inserts and verses by Stuart R. Kaplan to assist the reader in interpreting the card meanings. The 40-page instruction booklet includes a brief biography of Mlle Lenormand and card meanings. Botanical Inspirations pairs the Secret Language of Flowers with the artwork of Pierre-Joseph Redouté. Each card features a quotation relating to the flower's symbolism. The guidebook presents affirmations and narrative vignettes culled from history, mythology, lore and legend. Set includes 44 cards, 100-page illustrated guidebook, foldout guide, and organza pouch. The Brotherhood of Light Egyptian Tarot deck provides companion cards to the acclaimed book The Sacred Tarot. The original 1936 black and white images have been redesigned as full-color Egyptian tarot cards. Includes 48-page booklet. A beautiful gift set of 40 Divine Wisdom cards inspired by the sacred texts of the ‘Pranjnaparamita Sutras’ known as the Perfection of Wisdom. These sacred texts represent the divine feminine consciousness in Buddhism and are used to transcend mental obstacles by opening up your heart to the divine guidance of Kwan Yin. The 40 Divine Truth cards were inspired by the sacred text of ‘Dhammapada Sutra’, which is widely known as the words of Buddha. With the energy of the divine masculine throughout these cards, The Ultimate Truth of Wisdom provides you with powerful tools to illuminate all darkness and free the limitations of the reasoning mind. The Buddhism Reading Cards provide a simple introduction to the fundamental teachings of Buddhism in a fun and practical way. Each card represents one core principal of Buddhism that contains a wisdom bringing healing, direction and inspiration to your life. The peaceful Buddha imagery helps the wisdom to flow easily. The boxed set includes 36 cards and a fully illustrated 104-page guidebook. Welcome these beautiful butterflies, creatures of hope and renewal. These cards present affirmations to help you remember the courage and wisdom to be brave during struggles and never give up on your dreams. Simply relax, choose one of the 44 cards and read its message of healing and happiness. CARY-YALE VISCONTI 15TH CENTURY TAROCCHI DECK This complete 86-card Cary-Yale Visconti Tarocchi deck includes refined facsimile reproductions of 67 extant 15th century cards, plus 19 cards recreated to replace missing cards from the original pack. This deluxe edition includes a 68-page guidebook with color illustrations, expanded meanings by Stuart R. Kaplan, and an in-depth history of tarot cards by Thierry Depaulis. Published posthumously as a tribute to its creator, Yoav Ben-Dov, this Marseille deck is a faithful reproduction of the traditional tarot cards created by the esteemed Nicholas Conver in 1760. This vibrant 79-card deck includes an extra blank logo card to be used as a carte blanche. Also included is a 56-page booklet. Celestial Tarot interweaves mythic images and astrological divinations. Celestial Tarot is both a handbook of the heavens and an oracular guide to the inner life. Includes booklet and custom spread sheet. $21.95 ITEM # CEL78	78 cards, 2.75” x 4.75” Printed in Italy Also by Kay Steventon: Spiral Tarot (page 57). This Celtic-themed deck brings naturebased paganism to the Lenormand system. This 45-card deck provides additional tree, animal and people cards. The 188-page illustrated guidebook offers in-depth descriptions and interpretations based on the phases of the moon and the Wheel of the Year. Also by Kim Dreyer: Angel Inspiration Deck (page 17). Book sold separately (page 69). This compelling deck features symbols and icons gathered from diverse eras, creating accessible images for all tarot readers. Interpretations are provided on the individual level, the human community, and the cosmos. Includes 36-page booklet. $26.95 ITEM # CS78	78 cards, 2.75” x 4.75”	Printed in Belgium Also available: Spanish Cosmic Tarot (page 71). This powerful oracle deck is encoded with crystal frequencies and the high vibrational energy of angels, ascended masters and goddesses. The 54 cards empower you to channel the divine healing power of Heaven and Earth. Working with the vibrant crystal mandalas can enhance your connection to the energy of the crystals and higher beings in order to heal your body, mind and soul. This inspirational deck of 40 mini-cards captures the beauty and wisdom of our Earth’s crystals. Each card presents a different crystal along with its universal loving message, written by Australia’s leading Crystal Awakening Healer, Rachelle Charman. Deviant Moon Tarot explores the dark side of the subconscious with haunting surreal imagery. Stylized moon-faced characters, created from manipulated photographs of 18th century tombstones, are set against evocative backgrounds. Custom spread sheet and instruction booklet included. Stylized characters and moonlit dreamscapes draw you into the luminescent world of Deviant Moon Tarot. With larger cards, this special Borderless Edition highlights Patrick Valenza’s stunning artwork and allows readers to connect more deeply with the evocative tarot imagery. Includes 48-page booklet. $21.95 ITEM # BDM78 78 cards, 2.64” x 5.16” Made in China Also by Patrick Valenza: Deviant Moon Tarot Book (page 68). Dogs are regarded by many as wise and loyal creatures. Now you can share in their wisdom with this delightful card set. The 45 Dog Wisdom cards allow you to easily and quickly receive inspirational messages for everyday life. This spectacular deck captures the perceptive powers of the legendary dragon. Dragon Tarot represents the fulfillment of centuries of research into symbolism by mystics from the world over. Includes 24-page booklet. This oracle set was created to help you set your spirit free and to encourage expression of your unique creative self. With artwork by a collaboration of nine talented artists, the vibrant 44-card deck helps you break away from the ordinary and embrace the extraordinary. The 136-page illustrated guidebook is filled with powerful healing strategies and affirmations. This beautiful set of 40 inspirational cards can give you the simple, direct answers you need to guide you past any obstacles in life. These cards provide visual reminders to help you to focus your intentions on what you would like from the Universe. Divine Directions Cards bring clear inspiration to steer you to the right path. This charming 36-card Petit Lenormand deck offers fresh, new perspectives. Artist Kwon Shina’s imaginative style provides the reader with clever visual cues that capture the mood and inner meanings of the cards. The 92-page booklet offers quotations and interpretations that help the reader understand the lively interplay between the cards for insightful readings. Dreams of Gaia offers familiar tarot structure with the Majors representing all aspects of ourselves, and the Minor suits based on the four elements. By incorporating bold new archetypes and contemporary meanings, Dreams of Gaia allows for a more personal and effective system for using tarot cards as a roadmap to navigate your life path. This deluxe set of 81 gilded cards and 308-page book assists in deepening your own intuition. Earth Power Oracle reconnects us with the energy of 41 of the most sacred places on the globe. This magnificent oracle takes you on a mystic journey to ancient temples, natural sanctuaries, breathtaking landscapes, the haunting ruins of lost civilizations, and sacred waterways. Boxed set includes 41 cards and 128-page illustrated guidebook with descriptions, locations, and card spreads. Faerie Tarot invites you to see the world in a delightful new way. This original deck offers fresh interpretations of traditional tarot, with vibrant art blending fantasy, whimsy and nature. Every card comes to life with exquisite details and charming motifs inspired by the four seasons. Includes 48-page booklet. $21.95 ITEM # FAE78	78 cards, 3.55” x 4.75” Printed in Italy Also by Nathalie Hertz: The Vampire Tarot (page 63). Lucy Cavendish guides you to the path of the Green World where the inhabitants of the Faery Forest offer you their insights, revelations and natural, wild wisdom. Discover goddesses, faeries, witches, wise ones and wizards; powerful and trustworthy ancients and allies devoted to nurturing the wisdom that lies deep within your soul. Set includes 45 cards and 136page guidebook. Grounded in the epic tradition of faerytales, this enchanting oracle reveals the timeless wisdom in stories like The Little Match Girl, Cinderella, and Hansel and Gretel. This magickal deck also presents undiscovered gems, unearthing tales that inspire and delight. This 44-card deck and 185-page guidebook offer compassionate and uplifting guidance to help navigate life’s challenges. With luminous artwork, Fantastical Creatures Tarot offers glimpses of the mystical beings that inhabit our imagination, and reveals the lessons they can teach us. Includes 72-page booklet and Quick Reference card. Thai artist, Chatriya, has creatively fused traditional tarot symbolism with elements from her own culture and influences as far reaching as Egypt, Art Deco, mythology, and Japanese manga. Fenestra Tarot features beautifully rendered figures set off in frames suggestive of arched windows. Includes 24-page booklet. Also by Lisa Hunt: Ghosts & Spirits Tarot (page 34). This charming set of 40 inspirational mini-cards presents gentle reminders of life’s beauty through the hidden meanings of flowers and the symbolic connection they share with us. Each card presents a flower in soft watercolor art, along with an affirmation. Ghosts and Spirits Tarot explores the fascinating subject of ghosts, surveying supernatural lore and legend. 78 ethereal beings, both frightening and friendly deliver their messages from beyond, through the symbolism of tarot. Includes bonus card and instruction booklet. $21.95 ITEM # GAS78 79 cards, 2.75” x 4.75” Printed in Italy Also by Lisa Hunt: Fantastical Creatures Tarot (page 32) and Fairy Tale Lenormand (page 32). Gilded Reverie Lenormand showcases the digital talents of Ciro Marchetti with captivating imagery on 47 gilt-edged cards. This Expanded Edition deck features eight special supplemental cards: Time, Bridges, Dice, Mask, Well, Compass, Labyrinth, and Magnifying Glass. This deck also provides extra Man, Lady, and Owl cards. Includes updated 80-page instructional guidebook. $21.95 ITEM # GRE47 47 cards, 2.75” x 4.125” Box, 4.5” x 3” Made In China Also by Ciro Marchetti: Fin de Siècle and Tarot of Dreams (page 33 and 59). Based on the notebooks and records of the Order of the Golden Dawn, these cards include references to symbolism of diverse religious and spiritual origins. Includes 30-page booklet. $21.95 ITEM # GD78	78 cards, 3.125” x 5” Made in China Also by Robert Wang: The Jungian Tarot (page 40) and The Jungian Tarot Trilogy (pages 69 and 70). Comprised of collage imagery from the European masters‘ paintings, each meticulously researched and chosen specifically for its divine evocations. The cards are treated with gilt edges and packaged in a deluxe display box with an illustrated book. Also by Kris Waldherr: Ask the Queens, Lover's Path Tarot, and Sacred World Oracle (pages 21, 42 and 55). The Halloween Oracle offers a chance to connect with “the other side.” Harness the eerie power of Halloween every night of year, encountering creatures like black cats, vampires, zombies and witches. Includes 36 cards and an 80-page guidebook featuring Halloween messages of divination. This colorful deck is designed to integrate the healing properties of traditional herbs with the symbolism of tarot. A different herb is identified and illustrated on each card. Includes 40-page booklet. $21.95 ITEM # HE78	78 cards, 2.75” x 4.75” Made in China Also see The Spirit of Herbs book (page 70). Cheerful angels and fairies deliver wisdom, healing energy and loving guidance to help you rediscover passion and joy in your life. You will find inspiration in the dreamy artwork with empowering exercises, prayers and affirmations. Includes 44 cards and 56-page illustrated booklet. $21.95 ITEM # IW44 44 cards, 3” x 5” Made in China See also: Joyful Inspirations (page 40). Tarot artist Paulina Cassidy has filled both the Major and Minor Arcana with charming new characters that bring their inspirational messages of joy to everyone. Includes 60-page booklet. This 70-card oracle deck features luminous artwork that evokes the divine nature of love at the heart of all our relationships. Profound messages of guidance are accompanied by inspirational poetic verses by Richard Cohn in a 164page guidebook. Also by Paulina Cassidy: Paulina Tarot, Spiritsong Tarot and Witchlings (page 51, 58 and 67). Also by Rassouli: Dream Oracle Cards (page 8). Inspired by the ancient seals that have become powerful symbols in the world’s religions, King Solomon Oracle Cards tap into personal intuition to provide profound insights and answers to contemporary inquiries. Includes 36 oracle cards, four Personal Amulet Cards, and instruction booklet. Inspired by the goddess of mercy and compassion, Kuan Yin Oracle guides you to a place of inner peace and beauty. Kuan Yin’s gentle energy reaches out to you from each of the 44 cards in this radiant deck. The 144-page illustrated guidebook provides inspirational messages, healing prayers and practical exercises. $23.95 ITEM # KO44 44 cards, 4.75” x 5.5” Box, 5” x 6.5” Made in China See also: Pocket Kuan Yin Oracle (page 52). Also by Robert Wang: The Golden Dawn Tarot, The Jungian Tarot and its Archetypal Imagery, Perfect Tarot Divination, The Qabalistic Tarot, and Tarot Psychology (pages 35, 69, 69, 70 and 70). Filled with circus and sideshow lore, LeGrande Circus & Sideshow Tarot is set in the glitter and mud world of the midcentury truck show. The Major Arcana presents the iconic figures of the big top illustrated in the bravura style of vintage circus posters. Each suit represents a different aspect of life on the lot. Includes 60-page booklet. Les Vampires is a profound oracle for healing our inner fears, harnessing our power, and dissolving the patterns that hold us back. Full of wise guidance, comforting advice and thoughtful challenges, this stunning deck offers a pathway through the darkest, most troubling times. Includes 44 cards and 136-page illustrated guidebook. The Lover’s Path Tarot marries the tarot to traditional archetypes, and teaches us that all love relationships mirror our truest natures. Whether seeking to improve and expand upon a love relationship with one’s partner or one’s self, The Lover’s Path Tarot fosters individual growth and understanding. Includes spread sheet and booklet. Magdalene has been seen throughout the ages as the Dark Goddess of gentle strength and holder of infinite compassion. With this energy, the cards reveal the wisdom and loving guidance of the feminine principle. Set includes 45 inspirational cards and 72-page illustrated guidebook. This exquisite deck by popular artist Jody Bergsma presents 44 oversized cards with inspirational images and affirmations to help you channel the magic all around you. The 28-page booklet provides gentle, yet powerful messages. Packaged in a deluxe box. Also illustrated by Jody Bergsma: Spirit of the Wheel Meditation Deck (page 57). In this 78-card deck the 22 Major Arcana depict a path of life, starting from the Seed/Fool card and completing with the Dancer/World card. In the Minor Arcana the four suits are Stones (coins), Pipes (wands), Arrows (swords), and Bowls (cups). Includes 24-page booklet. The glory of felines is celebrated with Renaissance flair in the 78 cards of Medieval Cat Tarot. This ornate deck bridges the gap between past and present by blending classical and contemporary ideologies along with artistic styles. Includes 48-page booklet. Travel back to the grandeur of 15 century Italy through the art of this tarot deck. The Middle Ages are recreated with symbols, costumes, and settings against gold backgrounds. Includes 48-page booklet. $23.95 ITEM # SM78	78 cards, 2.75” x 5.125” Printed in Italy Also available: Art and Arcana book (page 68). Messenger Oracle strengthens our ancient bond with nature and spirit. These cards are infused with the magic of ancient dragons, elemental fae, mystical trees, and their animal kind—they are the “messengers” who are here to guide us back to our true nature. The illustrated 75-page booklet provides inspirational messages and card spreads. Magical imagery and full scenes grace the intensely colorful cards in this popular borderless tarot deck. Includes instructions. This special set of 40 vibrant cards illustrates 35 mudras and 5 elements. The mudra poses were chosen to awaken the energy of the five elements, and can be used with the first Mudras deck/book set. The 124-page instructional guidebook explores the many benefits of yoga mudras. Inspired by the famous 18th century fortune-telling cards by Mlle Lenormand, this 36-card deck allows you to use your own intuition and associations to interpret the cards. The booklet offers card meanings, and includes instructions for three different card spreads. $15.95 ITEM # ML36 36 cards, 2.625” x 3.5”	Printed in Belgium See also Mystical Lenormand book (page 69). Also by Josephine Wall: Nature’s Whispers Oracle Cards and Whispers of Love Oracle (pages 48 and 65). An inspirational deck authentically representing the folklore, symbols, and beliefs of different Native American tribes, including: Apache, Arapaho, Cherokee, Cheyenne, Chippewa, Comanche, Hopi, Huron, Inuit, Iroquois, Kiowa, Navaho, Papago, Pima, Pueblo, Shawnee, Sioux, and Yaqui. Includes 108-page booklet. Re-ignite your connection to the great spirit of Mother Earth and tap into the profound peace, healing and guidance she offers us. Set includes 50 cards and 72-page illustrated guidebook. Since its 1989 publication, The Mythic Tarot has been an international success. New life has been breathed into this classic deck with all new illustrations. The cards provide wisdom and guidance for seekers of personal growth. Also by David Palladini: Aquarian Tarot (page 19). 43 oversized cards introduce a gallery of magickal beings. Illustrated 164-page guidebook shares words of wisdom from the Dragonfae, with descriptions of their divinatory powers. $23.95 ITEM # DFO43 43 cards, 3.75” x 5.5” Made in China Also by Lucy Cavendish: Wild Wisdom of the Faery Oracle (page 66). The lush Victorian-influenced images of the Oracle of Visions deck provide unique perspectives for insightful divination and meditation. The imaginative scenes encourage us to set aside pre-conceived ideas and investigate the choices, and consequences we face each day. Set includes 52 cards and 140-page booklet. $22.95 ITEM # ORV52 52 cards, 3.75” x 5.5” Made in China Also by Ciro Marchetti: Fin de Siècle Kipper, Gilded Reverie Lenormand and Tarot of Dreams (pages 33, 34 and 59). The lavishly illustrated 79-card tarot deck aids in achieving enlightenment through meditation. The accompanying 176-page book is a straightforward guide to using this intriguing system. Spread sheet is not included. This historical deck, printed in vivid colors on gold backgrounds, is based upon original designs by the Swiss kabbalist, Oswald Wirth. The 22 Major Arcana have French titles and the letters of the Hebrew alphabet attributed to each card by Eliphas Levi, and popularized by Oswald Wirth. Includes instructions. Paulina Tarot draws us in with its delicate beauty. Once we have entered this magical place, we encounter a charming world of energy and inspiration. Each time we return, there is something new to be discovered. Includes 48-page booklet. $21.95 ITEM # PAU78 78 cards, 2.75” x 4.75” Made in China Also by Paulina Cassidy: Joie de Vivre Tarot, Spiritsong Tarot and Witchlings (pages 39, 58 and 67). Best Divination Deck Lovingly created with artwork from the Smith-Waite® Tarot deck and "The Golden Vanity”, this charming 36-card Petit Lenormand deck pays tribute to Pamela Colman Smith. The 132-page booklet includes keywords and expanded meanings for Love and Career issues. This unique Lenormand deck comes in an adorable tin. Harness the strength, boldness and fierce optimism of Wild Kuan Yin with this borderless pocket-sized deck. Draw on one of the beautifully illustrated 44 cards whenever you need a message of encouragement to take a risk for what you love, a light in times of darkness, the courage to dare to be different or a reminder of your fire, your passion, your unique beauty. The most ancient of the Germanic peoples’ magical written symbols offer deep insight into the hidden structures of the cosmos and the secrets of the human psyche. Includes 25 cards and 36-page booklet. Primal Lenormand is a facsimile of the original Game of Hope cards published in 1799. The deck was initially conceived as a parlor game to be played with dice. Fifty years later the cards were used for divination by Mlle Lenormand. This Petit Lenormand deck has 36 cards. The booklet includes instructions for both the game and the oracle, in English, French and German. The raven has always played a guiding role in myth and legend. The Raven Cards reveal insightful messages for confronting today’s choices. Use inspiration cards individually or in a spread. Set includes instructions and blank cards for creative use. Renaissance Tarot takes its inspiration from the splendor of Italian Renaissance culture and classical mythology. The 22 Major Arcana cards feature Olympian deities. In the Minor Arcana, the four suits are represented by four familiar myth cycles, and the great cities of Renaissance Italy are represented in the court cards. Also available: Spanish Raven Cards Oracle Deck (page 71). Sacred Rebels Oracle helps you celebrate and nurture your individuality. This oracle deck is filled with striking imagery and beautiful, heartfelt guidance to support you in awakening your sacred rebellious heart. Set includes 44 cards and 180-page illustrated guidebook. of the Year The Sacred World Oracle celebrates the beauty of the earth and the diversity of its creatures. Drawing from mythology, folklore and nature this deck offers gentle guidance and practical wisdom. The 48-page booklet presents keywords, narrative descriptions and card spreads. $16.95 ITEM # SWO44 44 cards, 3.6” x 4.6” Made in China Also by Kris Waldherr: Ask the Queens, Goddess Tarot, and Lover's Path Tarot (pages 21, 35 and 42). Let the enchanting artwork of Mary Alayne Thomas enfold you in a world of stunning beauty and imagination as the colorful denizens of the Mystic Grove share their insightful secrets. This special set includes 44 cards and a 96-page guidebook presenting keywords, inspirational messages and journal prompts with space provided to write down thoughts. Inspired by North American Indian tradition, legend, life, lore, and religion. Readers may use the 65 cards in this deck to develop their own psychic medicine and power on the journey through the physical and emotional worlds. Comes with 76-page booklet. Designed to inspire inner wisdom and creativity, each deck of 60 evocative images fosters insightful exploration of the mind and soul. The special packaging may be used as a frame. This collaborative deck brings together sacred feminine wisdom inspired through Mother Earth’s nourishing energy. The Soulful Woman Guidance Cards will inspire your feminine soul and empower you in your journey of manifestation. Featuring the artwork of 26 soulful women artists, this beautiful set includes 48 cards and an 80-page illustrated guidebook. The ancient symbol of the spiral has been used throughout time to express the continuum of life. Spiral Tarot explores the legends of mythical imagery and ancient Celtic wisdom. Includes spreadsheet. $21.95 ITEM # SPT78 78 cards, 2.75” x 4.125”	Also by Kay Steventon: Celestial Tarot (page 24). Spiritsong Tarot energizes the cards of traditional tarot with the majestic beauty and wisdom of 78 animals that have been called upon to help guide you on your life journey. Paulina Cassidy’s exquisite artwork invites you to connect to the spirit of each animal, specifically selected based upon Shamanic symbolism. Spiritsong merges each animal’s unique power with classic tarot practices. Includes 78-card deck and 108-page guidebook. The perfect choice for beginning readers. Regular and reverse meanings are printed on each card to facilitate readings. The artwork is in the style of ancient woodcuts, based on traditional motifs. Inspired by Marseille-style woodcut tarot decks, Tarot de Maria Celia blends faux vintage elements with modern illustration techniques. Narciso preserves many of the Marseille traditions, including French titles, while adding his own colorful interpretation of the cards. 78 cards with 56-page booklet, in a tin. $18.95 ITEM # TDMC78 78 cards, 2.25” x 3.5” Tin, 2.625” x 4.125” Made in China Also by Lynyrd-Jym Narciso: Vanessa Tarot (page 63). Also by Ciro Marchetti: Fin de Siècle, Gilded Reverie Lenormand and Oracle of Visions (pages 33, 34 and 50). This deck combines science fiction and fantasy. A mystical rapport with cats is established in a distant place known as the "Outer Regions.” Includes 78 cards and 64page booklet. $21.95 ITEM # CP78	78 cards, 2.625” x 4.625” Printed in Italy Also available: Tarot of the Cat People book (page 70). A modern approach to what is known as the magical Old Religion, the Craft, or the Old Path of female wisdom. Includes 78card deck and booklet. $25.95 ITEM # OP78	78 cards, 2.75” x 4.75”	Printed in Belgium Also available: Spanish version of Tarot of the Old Path (page 71). Tea Leaf Fortune Cards set offers an innovative system for reading with 200 beautifully illustrated cards depicting the traditional tea leaf symbols. The 98-page guidebook explains how to divine fortunes using tea leaves or Tea Leaf Fortune Cards. Rae Hepburn, an accomplished tea leaf reader, teaches you to unlock the ancient secrets of reading tea leaves. Set includes 200 round symbol cards; drawstring pouch; and 98-page illustrated guidebook. Discover the buried secrets in Under the Roses, a charming 40-card Petit Lenormand deck. In addition to the 36 standard cards, this deck includes alternate cards for the Child, the Gentleman, and the Lady. The 60-page booklet offers keywords, instructions and diagrams for learning to read with the Lenormand method. The magical unicorn offers wisdom and guidance in this enchanting tarot deck. Includes 24-page booklet. $21.95 ITEM # UT78	78 cards, 2.75” x 4.75”	Printed in Italy Also Available: In Search of Unicorns book (page 69). Vampire Tarot offers formidable views into a world of darkness shrouded in mystery and beauty. Myths and legends of the devilish underworld are interpreted through exquisitely detailed paintings. Includes 36-page booklet. With humor, glamour, and an attitude of adventure, this delightful deck invites readers on a joyride through the Tarot. Taking their inspiration from pop culture, the sassy but sage characters of Vanessa Tarot playfully reinterpret traditional female roles. In a tin with a 32-page booklet. $21.95 ITEM # VMP78 78 cards, 2.75” x 4.75”	Printed in Italy Also by Nathalie Hertz: Fairie Tarot (page 31). $18.95 ITEM # VAN78 78 cards, 2” x 3.5” Tin, 2.625” x 4.125” Made in China Also by Lynyrd-Jym Narciso: Tarot de Maria Celia (page 59). This new edition presents an 80-card deck with expanded guidebook in a deluxe, hinged box. The 60-page guidebook features color illustrations of the tarocchi cards. Includes two bonus cards with portraits of Bianca Maria Visconti and Francesco Sforza. The 78-card deck is comprised of full-color facsimile reproductions of 74 extant cards from the 15th century and four meticulously recreated cards. Ganesha’s energy has the power to clear obstacles, bestow wisdom and promote prosperity and success. Work with this unique 50-card deck to invoke the blessings and protection of Lord Ganesha, patron of the arts and sciences and keeper of great knowledge. Set includes 92-page illustrated guidebook. Whispers of Love Oracle Cards were created to help you discover new ways to attract and build stronger, more loving relationships. Whether you are seeking romantic guidance or improved personal relationships, the 50 cards can lead you to answers and solutions. Includes 72page booklet. When peace seems far away, this oracle deck channels the energy of the Divine Mother to bring you comfort. Wild Kuan Yin reminds you of your fire, passion and courage. She’ll guide you through even the darkest trials. Set includes 44 cards and 140-page illustrated book. Lavishly illustrated cards are brimming with Faery secrets and loving guidance. Illustrated book delivers clear lessons on creating connections with your own Faery guardians. Set includes 47 cards and 188page illustrated book. See also: Pocket Wild Kuan Yin (page 53). Also by Lucy Cavendish: Oracle of the Dragonfae and Oracle of the Mermaids (page 50). The Witchlings share their uplifting spells to help you access your own powerful energy and natural abilities in this enchanting new deck and book set. The 204-page illustrated guidebook includes clear instructions for more than 150 spells with tips and insights. $22.95 ITEM # WIT40 40 cards, 3” x 5” Book, 204 pp., b&w illus., pb. Box, 3.25” x 5.25” Made in China Also by Paulina Cassidy: Joie de Vivre Tarot, Paulina Tarot and Spiritsong Tarot (pages 39, 51 and 58). Some Yoga Dogs are playful and others are pensive, yet each one shares a message of yoga wisdom to guide you through these fun yoga challenges. 44-card deck features the irresistible photography of Dan Borris. Includes 96page instruction book. Yoga Cats Deck & Book Set features the delightful animal photography and clever digital craft of Dan Borris. This deck is purrfect for cat lovers, yoga lovers, and all those looking for reasons to smile. The set includes 44 cards and a full color 96-page guidebook. Guides the reader through the history of tarot while reflecting upon 15th century Italy and the wonderful artwork that comprises this lavish deck. $9.95 • ITEM # BK204 4.625” x 7”, 282 pp., b&w illus., pb. This illustrated companion to the Chrysalis Tarot explores the spiritual journey of selfdiscovery. $12.95 • ITEM # BK233 5” x 7”, 216 pp., b&w illus., pb. $17.95 • ITEM # BK129	7” x 10.25”, 224 pp., b&w illus., pb. Illustrated with the Radiant Rider-Waite Tarot, Exploring Tarot is a user-friendly handbook for beginners as well as experienced readers. $35.00 • ITEM # BK4	8.5” x 11”, 412 pp., b&w illus. w/16-page color insert, hc. $45.00 • ITEM # BK6	8.5” x 11”, 728 pp., b&w illus. w/16-page color insert, hc. $14.95 • ITEM # BK235 5.5” x 8.5”, 272 pp., color illus., pb. An indispensable guide to mastering the language of feminine symbols and ancient mysticism used in the best-selling Goddess Tarot deck. $12.95 • ITEM # BK180 4.625” x 7”, 208 pp., b&w illus., pb. Volume III details the world of tarot in the twentieth century with copious illustrations of published, unpublished, and out of print cards. In the first major reference work of its kind, this comprehensive volume traces the history and origins of the earliest extant tarot, tarocchi, and tarock decks. Acclaimed psychic Suzanne Star describes her spiritual encounter with unicorns, and describes how to harness the power of the unicorn to realize one’s strengths and potential. Introduction to Tarot offers a comprehensive guide with detailed explanations of both the Rider-Waite® and Crowley Thoth decks. The feminine voice produces an added dimension to each of the Major Arcana cards, and encourages the reader to further call upon the "other” in him or herself. Illustrated with the Morgan-Greer Tarot. $9.95 • ITEM # BK142 4.625” x 7”, 176 pp., b&w illus., pb. $18.95 • ITEM # BK214 7” x 8.5“, 246 pp., color illus., pb. $10.95 • ITEM # BK112 4.75” x 9.75”, 92 pp., b&w illus., pb. Positive support is offered to mend hurts and strengthen personal values. The images depict women of power and men of love living a life in harmonious balance. $14.95 • ITEM # BK114 4.625” x 7”, 239 pp., b&w illus., pb. An indispensable guidebook for anyone interested in earth-based or women’s spirituality. $9.95 • ITEM # BK139 4.5” x 7”, 128 pp., b&w illus., pb. Volume III applies astrology and Jungian principles to tarot interpretation. $13.95 • ITEM # BK243 5.25” x 8.25”, 102 pp., b&w illus., pb. Waite describes each card of the RiderWaite® Tarot deck, including regular and reversed meanings. $9.95 • ITEM # BK18	4.25” x 7”, 340 pp., b&w illus., pb. $5.00 # BK221 4.625” x 7”, 96 pp., b&w illus., pb. Focusing on the daily tarot card, Rachel Pollack and Johannes Fiebig offer simple yet powerful practices based on their interpretations. This illustrated companion to The Jungian Tarot deck applies Jungian principles of "active imagination” to the tarot archetypes, providing a meditative and self-explorative approach to tarot. $13.95 • ITEM # BK242 5.25” x 8.25”, 120 pp., b&w illus., pb. Provides fascinating insight into the stunning illustrations of the popular Tarot of the Cat People deck. $9.95 • ITEM # BK91 4.625” x 7”, 179 pp., b&w illus., pb. $11.00 • ITEM # BK230 5.45” x 8.37”, 160 pp., color illus., pb. This book traces the background of the Tarot of the Witches deck designed by Fergus Hall and featured in the James Bond movie Live and Let Die. $4.95 • ITEM # BK21	4.5” x 7”, 96 pp., b&w illus., pb. con titulos e intrucciones en Español. Cards and booklet in Spanish. GTBL) can be ordered with any tarot deck in this catalog at no extra charge. Suitable for most tarot decks. Book by renowned tarot authority, translated into Spanish. Spanish titles on cards. Booklet in English. The Raven Cards reveal insightful messages for confronting today’s choices. Each vibrantly colored envelope presents: 3 mini Radiant Rider-Waite® Tarot cards; instructions for Past, Present, and Future Spread; card meanings and interpretations. Each envelope offers a unique combination of cards. Velveteen drawstring pouch is perfect for storing and carrying your favorite tarot deck or other cards. $5.95 ITEM # BAG1 Pouch, 5" x 7"
BLANK CARDS Make your own tarot, playing card, or original game deck with a set of 80 roundcornered, blank cards with tarotee plaid backs. Also perfect for creating flash cards, educational cards, recipe cards, and many other projects. Products shown in purple are Premier Editions.